Hello! I'm R.D. Hero, the author of Wet Heat, a book about werewolf menopause, nefarious alphas, and party-boy omegas. I'd like to thank the blogs hosting this tour. Follow along to read more about the world and characters of Wet Heat! Most omega werewolves want a mate and pups, but Lee Aung prefers an unconventional party-boy lifestyle. Yet at forty-two, he’s stopped going into heat, which means he’s expired goods—no longer a fertile, young omega that alpha wolves drool over. So Lee uses Wet Heat, a synthetic pheromone, to reel in the alpha hookups. R.D. Hero bombed out of art school. After that, she admitted writing might be the best course of action, and hopped to it. She likes writing about people who shouldn't fall in love, which she's been doing for about eight years. Starting with online serial fiction, R.D. developed her favorite tropes and dynamics, writing what she wanted to read. Aside from that, she loves spicy food, boxer dogs, camping, and photography. 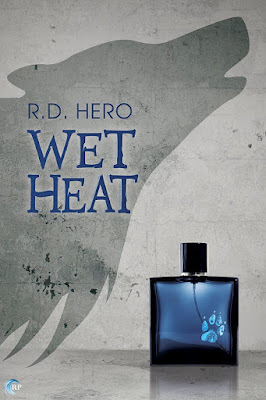 To celebrate the release of Wet Heat, R. D. is giving away $15 in Riptide Publishing credit. Leave a comment with your contact info to enter the contest. Entries close at midnight, Eastern time, on June 25, 2016. Contest is NOT restricted to U.S. entries. Thanks for following the tour, and don’t forget to leave your contact info!